At the start of the year, I listed the five films I was excited about at the first half of 2018, luckily I remembered to update the list for the second half of the year. Whilst for me 2018 was all about seeing Avengers: Infinity War, there are still plenty of interesting movies released later this year. Of course, it is going to be a little strange not having a new Star Wars movie in December. In recent years, we have started a few traditions around Christmas involving seeing the newest Star Wars movie, a midnight release with friends and then with family on Boxing Day. As a result, of the Solo movie’s May release, we are going to have to find something else to watch instead. The end of Avengers: Infinity War left me wanting the next instalment in the MCU. Luckily, we didn’t have to wait too long (Well we had to wait longer in the UK). Whilst I am excited to see the sequel. I am really excited to see Wasp in action (I still get so happy to see decent female superheroes onscreen). At the same time, I want to see how this movie tied into Avengers: Infinity War and that ending! It surprised me how much I loved the first Fantastic Beasts movie. Whilst I loved the idea of heading backing into the Wizard World. I was unsure if it would be the same without Harry Potter and Co. But, J.K. Rowling yet again weaved her magic and I fell in love with a new gang of wizards! Now we get the chance to return to Hogwarts, see a young Dumbledore and hopefully meet some new fantastic beasts! This is a weird one, A Venom film without Spider-Man! How would that work? Yes, I do think of Venom as an anti-hero rather than a villain, so I guess he doesn’t need a “hero” in his story. Yet, the Venom origin’s story I know is linked to heavily to Spider-Man. Eddie Brock working at the Daily Prophet with Peter Parker. The Spider-Man rejecting the Symbiote and it finding Brock. It will be interesting to how they re-work this story. Plus it stars Riz Ahmed, so of course, I want to see this film. I was a little apprehensive about the Aquaman film. not because it is a “World of DC” movie after all Wonder Woman was amazing. The truth is I felt a little seasick watching the underwater scenes in Justice League. And was unsure I could watch a whole movie set underwater. In light of the trailer release at SDCC last weekend, I am now hooked! Mary Poppins is a great film from our childhoods. A classic Disney family movie, memorable songs, magic and dancing penguins! It’s pretty much perfect despite the dodgy cockney accent. This sequel has an amazing cast, notably the brilliant Angela Lansbury and Lin-Manuel Miranda. 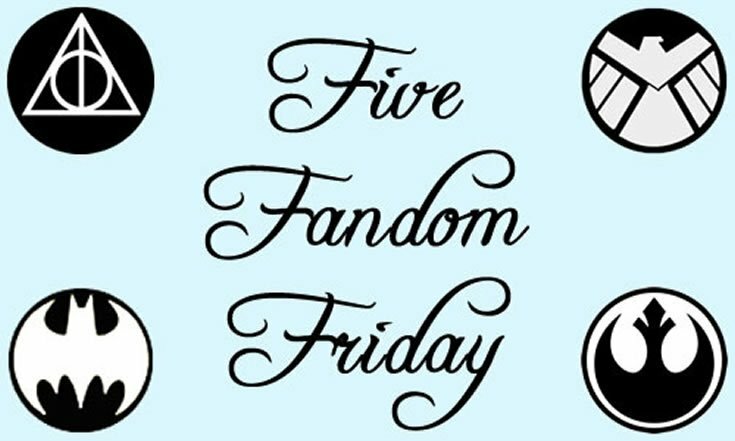 Fandom Friday was originally created by The Nerdy Girlie & Super Space Chick. If you want to continue joining in on the fun A Geeky Gal and Darling Stewie have created a DLC of prompts! Or follow #fandom5 or #5fandomfriday on Twitter.